Simple and quick cherry sauce make with either sweet or sour cherries, fresh, canned or frozen cherries. I am still trying to get through the last of my sweet cherries… So many of them this year and I picked as many as I could reach. I preserved countless jars of cherries, made cakes like this Swiss cherry tart or Cherry Brownies that I would like to post during the next days, roasted cherries on top of strained yogurt and so on. And I’ve made this cherry sauce to serve on waffles as well. I’ve made this sauce so many times, I could make it in my sleep. I never really weigh or pay much attention to the quantities, I use as many cherries as I have, whatever kind I have, I add sugar and lemon juice to taste and use as much cornstarch as needed to get the right consistency. Sometimes the sauce is thinner, sometimes thicker, depends on how full the tablespoon of cornstarch is. But for the sake of the blog I did measured thoroughly this time. But don’t get too bothered by that, please. If you don’t have as many cherries as that is OK, if you use a bit more juice or water is OK as well, if the sauce is thicker or thinner you can either thicken it more by adding more cornstarch or thin it by adding more water. And you should definitely add sugar and lemon juice according to your taste, some like it sweeter, some tarter. Everything goes! What cherries to use for homemade cherry sauce? As mentioned above this cherry sauce can be made either with fresh, frozen or canned cherries. The procedure is pretty much the same, the only difference would be that when using fresh or frozen cherries, I would simmer the cherries for 2 or 3 minutes to soften them lightly or to allow them to defrost and get warm if frozen. If you use canned cherries, this step is not necessary, canned cherries have already gone softer during the process of preservation. All you have to do in this case is to give them to the thickened liquid in the saucepan. Also you can make this sauce using sweet cherries or sour cherries. Usually, I use the sweet cherries from our cherry tree to make the sauce. When cherries are not in season, I use the cherries I preserved in summer. If I don’t have any preserved cherries anymore, I either buy frozen cherries (mostly sour cherries) or canned cherries, which are always sour cherries. Step 1: Strain the liquid if using canned cherries. Reserve about 4-5 tablespoons juice or water to mix with the cornstarch. Give about 180 ml/ ¾ cup of the cherry liquid to a saucepan. If there are more than ¾ cup juice in the can, you can use it all, just think of adjusting the cornstarch quantity needed to thicken the juice accordingly. If using fresh or frozen cherries, give about 180 ml/ ¾ cup water to the pot. Step 2: Add sugar. About 1-2 tablespoons for canned cherries, which already contain some sugar. 2 or 3 tablespoons for fresh or frozen sweet cherries and maybe 1 tablespoon more for sour cherries. It all depends on your taste. If you like make the cherry sauce using less sugar or make it sweeter. Step 3: Whisk together the reserved juice or water with the cornstarch. You should have a smooth, thick yet still pourable paste. Step 4: Bring the juice or water to a boil. Remove from the heat and whisk in the cornstarch mixture. Step 5: Add the cherries to the sauce and stir well. Return the pot to the heat, turn the heat down and simmer the fresh or frozen cherries for 2 or 3 minutes or until slightly softer. If using canned cherries, it is enough to let them bubble once or twice until the sauce is slightly thickened. Step 6: Add flavors. You can leave the cherry sauce plain and it will still be delicious. However, to make it even better add some fresh lemon or lime juice. Alternatively, you could flavor it with ½ teaspoon vanilla extract or almond extract or, in winter, with a pinch of cinnamon. You can serve the sauce either warm or at room temperature. A typical German way of serving the cherry sauce is on waffles, waffles with cherry sauce and whipped cream are a classic of the German cuisine. Otherwise you can have the cherry sauce on crepes or pancakes. You can have it with vanilla ice cream or with strained yogurt. You can top milk rice or semolina pudding with it. You can make a delicious and good looking dessert by layering mascarpone/cream cheese/Greek yogurt mixed with whipped cream and cherry sauce. Or you could serve it with the Yogurt Bomb instead of berries. And, by the way, this Yogurt Bomb is really the best dessert ever, you should definitely try it!!! You can thicken the sauce with a little more cornstarch and use it as a cake filling or cake topping. The Homemade Cherry Sauce keeps well in the fridge. Give it to an airtight container and it will keep for about a week. If you would like to reheat it, add 1 or 2 tablespoons of water and reheat on low heat while stirring often. Pit the cherries and set aside. If using canned cherries, drain them and keep the juice. Give 4-5 tablespoons of the canning juice to a small bowl. Give the rest, about 180 ml/ 6 oz/ ¾ cup juice to a saucepan. If using fresh or frozen cherries replace the juice with water. Bring the liquid to a boil. In the meantime whisk together the reserved juice (or water) with the cornstarch. You should have a thick yet still pourable paste. Remove the pot from the heat. Slowly whisk in the cornstarch mixture. Whisk well. Add the cherries and stir well. Give the saucepan back to the heat and simmer the cherries for 2 or 3 minutes if they are fresh or frozen. If using canned cherries let them bubble once or twice, then remove from heat. Stir in the lemon juice and either one of the flavors: vanilla extract, almond extract or cinnamon. Serve warm or at room temperature as suggested above. Note 1: You can use sweet or sour cherries, fresh, frozen or canned cherries. Note 2: Add more sugar if using sour cherries or to taste. 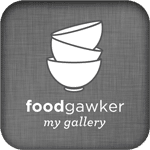 I subscribe to countless food blogs and yours is my favorite. I appreciate your hard work that you do to make your blog interesting and creative. Wow! You have been very busy! Lots of good recipes that I’ve missed. So glad I didn’t miss this one. I love cherries and would love to be lucky enough to have a tree. Lucky you! I’m envious. Your cherries are beautiful and this sauce looks so good! A gorgeous red! My cherries are just coming on and I have just begun picking them. 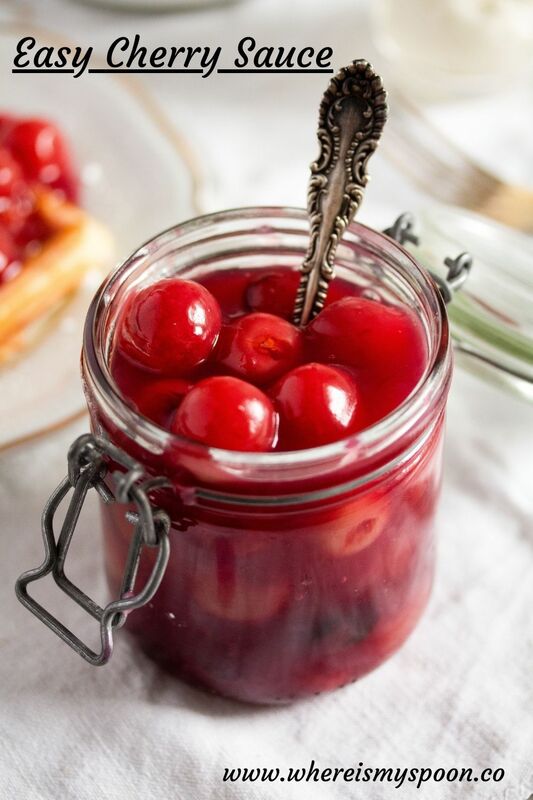 I love the idea of making cherry sauce – especially since I know I will have more than I know what to do with them all!